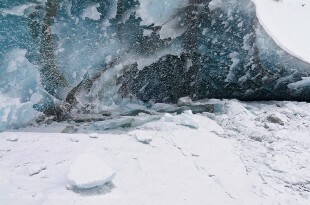 A selected portfolio of professional stock photos of glaciers. 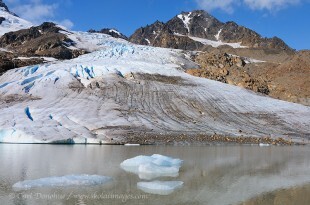 You’ll find tidewater glacier photos from the St. Elias Mountains, in southeast Alaska, as well as piedmont glaciers from the interior of the Wrangell St. Elias National Park, and Gates of the Arctic National Park. 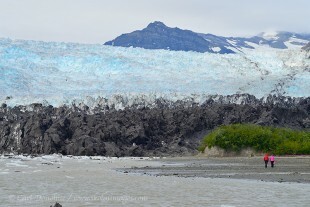 Glacier photos include photos of glaciers calving into the ocean, deep crevasses, ogives and banding, medial, lateral and terminal moraines, and more. Glaciers are formed when the rate of snowpack over each winter is greater than the rate of snowmelt in the summer. The process is ongoing and takes thousands of years. 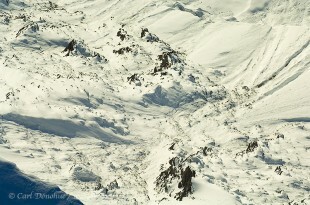 As the snowpack builds up over time, gravity forces it forward, and it (generally) carves its way down a mountain slope. 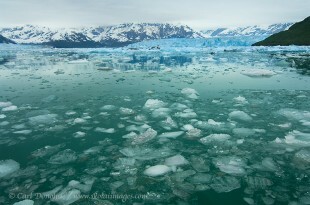 Glaciers that terminate in the ocean, such as Hubbard Glacier or Malaspina Glacier, are called tidewater glaciers. Glaciers whose terminus is on land, in a valley or lake or by a mountainside, are called piedmont glaciers. 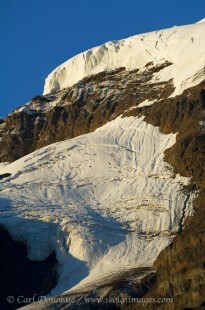 Kuskulana Glacier is a pediment glacier, as the Bagley Icefield (the largest non polar icefield in the world). Some of Alaska’s better known glaciers include Malaspina Glacier, Root Glacier, Tana Glacier, Hubbard Glacier and Kennicott Glacier. 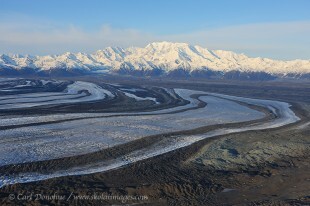 The St. Elias Mountain Range, in southeast Alaska, are home to some of the larger glaciers in North America. 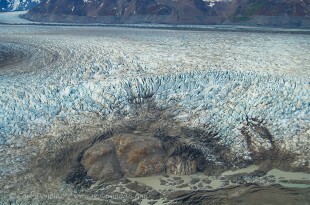 Kennicott Glacier, Wrangell - St. Elias National Park and Preserve, Alaska. Mt Bona and Russell Glacier photo. 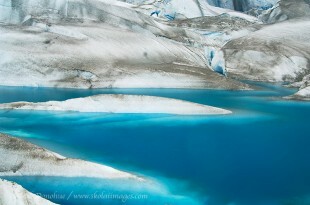 Blue tarn on Tana Glacier. 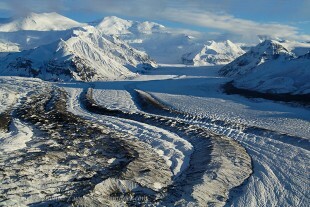 Kuskulana Glacier, Wrangell - St. Elias National Park and Preserve, Alaska. 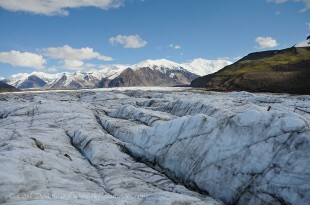 Photo of Ogives, Root Glacier, Wrangell - St. Elias National Park and Preserve, Alaska. 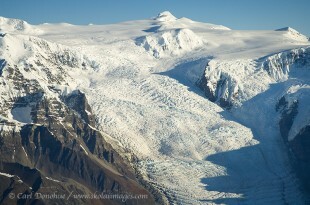 Aerial photo of moraines of Kennicott Glacier, on Mt Blackburn. 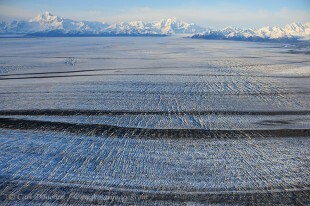 Aerial photo of the Gates Glacier in Wrangell Mountains. 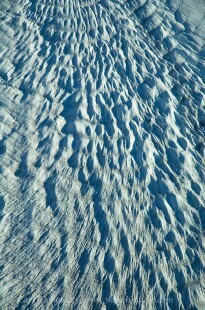 Crevasses on Russell Glacier, Wrangell St. Elias National Park, Alaska. 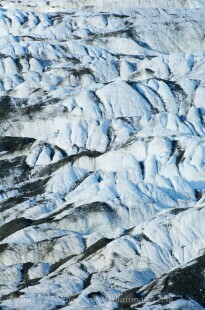 Fresh snow dusts the Kennecott Glacier, in Wrangell St. Elias National Park, Alaska. 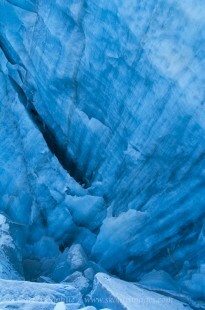 Photo of the blue ice from Kennicott Glacier in the Wrangell Mountains, Alaska. 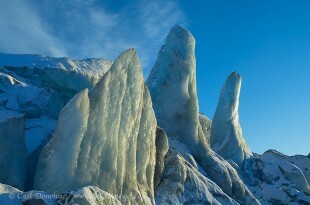 Sculpture of ice, Kennicott Glacier, Wrangell St. Elias National Park, Alaska. Stairway Icefall and the Root Glacier, Wrangell St. Elias National Park and Preserve, Alaska. 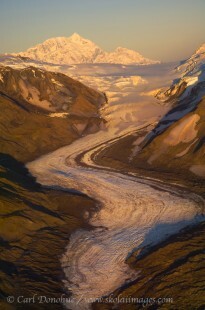 An aerial photo of ogives on Gates Glacier, Wrangell - St. Elias National Park and Preserve, Alaska. Broken glacier hanging from an unnamed peak in near Skolai Pass. 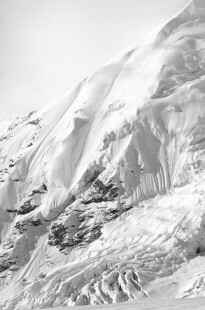 Black and white photo of a hanging glacier on the face of Mt. Jarvis. 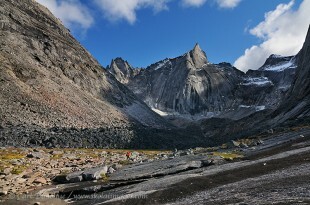 Old glacier valley, Arrigetch Peaks, Gates of the Arctic National Park, Alaska. Sprawling mountain glacier crawls into a small alpine tarn in the Chugach Mountains, Wrangell - St. Elias National Park and Preserve, Alaska. 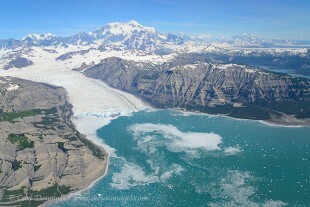 Aerial photo of ogives on Gates Glacier in Wrangell - St. Elias National Park and Preserve, Alaska. 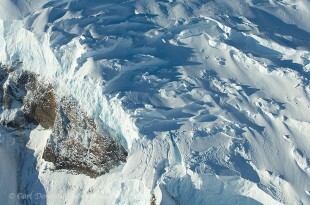 Aerial photo of a glacier hanging on the steep sides of Mt. Blackburn, Wrangell - St. Elias National Park, Alaska. 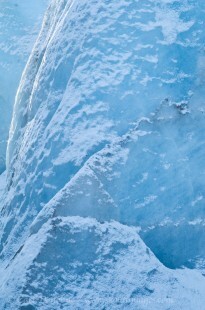 Photo of Stairway Icefall, a 7000' vertical wall of ice in the Wrangell mountains. 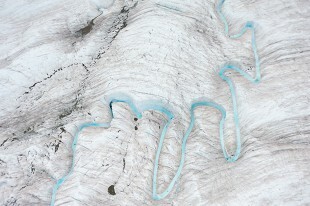 Looking directly down upon a hanging glacier, in the Saint Elias mountain range. 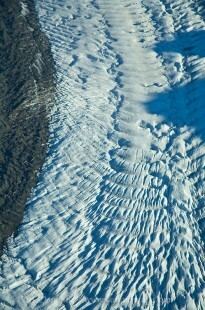 An unnamed glacier flows off the face of Mount Saint Elias. 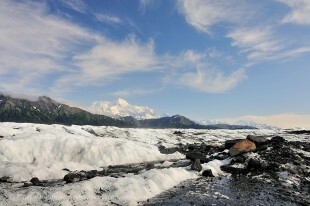 Pphoto of Russell Glacier in Wrangell - St. Elias National Park, Alaska. 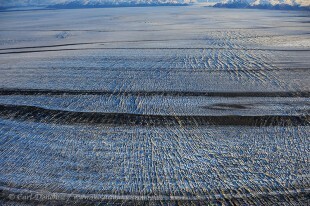 Aerial photo of Malaspina Glacier. Icebergs in Disenchantment Bay and the Hubbard Glacier, Wrangell - St. Elias National Park, Alaska. 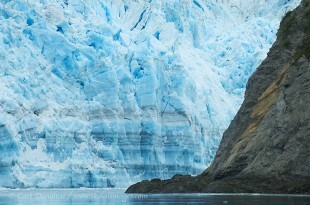 Gilbert Point and the Hubbard Glacier, Disenchantment Bay, Wrangell - St. Elias National Park, Alaska. 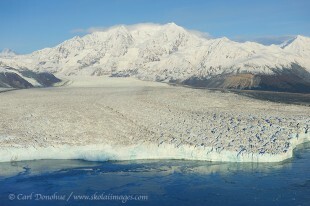 The Hubbard Glacier and Mt Seattle, Disenchantment Bay, Wrangell - St. Elias National Par, Alaska. 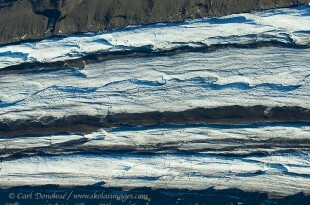 The incredible patterns of the moraines on Malaspina Glacier, & Mt. Cook, Alaska. Hubbard Glacier calving massive sheets of ice into Russell Fjord at Gilbert Point. A tidewater glacier in Disenchantment Bay, Wrangell - St. Elias National Park, Alaska. 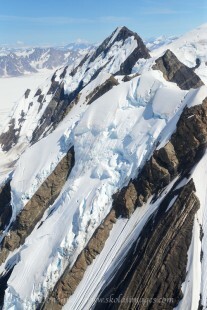 The Tana Glacier is a piedmont Glacier. Wrangell - St. Elias National Park and Preserve, Alaska. 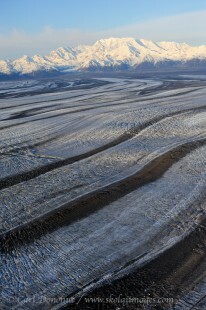 Medial moraine of Malaspina Glacier in Wrangell - St. Elias National Park, Alaska. 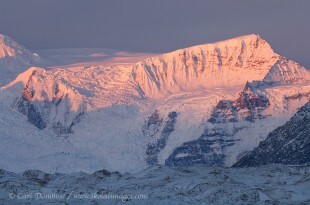 Malaspina Glacier at last light. 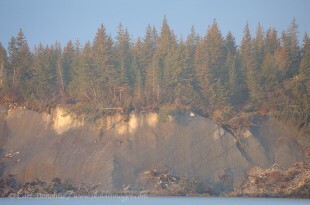 Spruce trees grow on top of the Malaspina Glacier, a tidewater glacier. 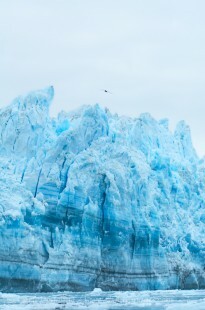 icebergs in icy Bay, remnants of the rapidly calving Guyot Glacier. Two hikers and the Yahtse Glacier, Icy Bay. Ice calves off the Yahtse Glacier into Icy Bay. 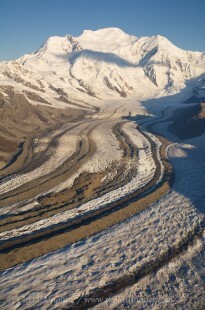 Aerial photo of hanging glacier on the St. Elias Mountains. 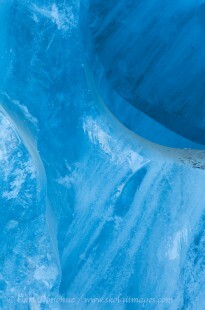 A moulin, or hole in the ice, on the Root Glacier, Alaska. 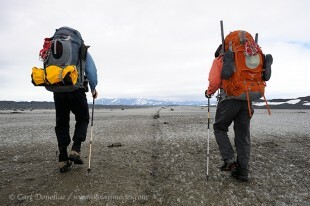 Two backpackers hiking across the Malaspina Glacier. Mt. 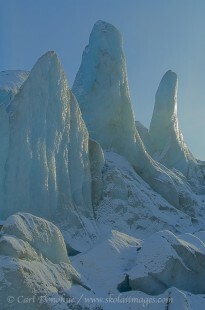 St. Elias towers above the Malaspina Glacier. 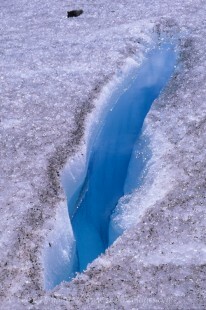 Deep crevasse in Kennicott Glacier, Wrangell - St. Elias National Park, Alaska. 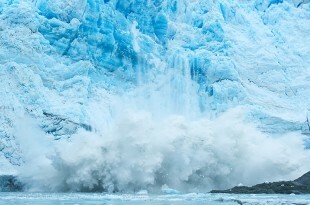 Roughly 10% of earth is covered with glacial ice, and these glaciers store over 70% of the world’s freshwater. In Washington state alone, glaciers provide 1.8 trillion liters (470 billion gallons) of water each summer. Most of the glaciers in the US are in Alaska, and the longest glacier in Alaska is the Bering Glacier, at 127 miles long. 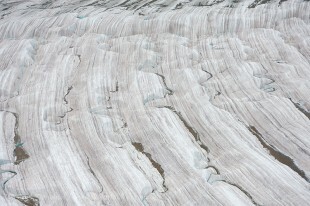 The Bagley Icefield is longer, but as it doesn’t “flow” it’s an ice field, not a true glacier. Many other glaciers flow off the Bagley, however. With global climate change a reality, the earth is now between ice ages, and another Ice Age is probably due in several thousand years. Glaciers are good indicators of climate change, and offer valuable signals as to these processes and changes. 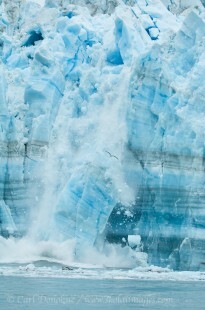 The blue ice often seen in glacier photos is a function of the density of the ice. As the weight of the accumulating snow forces any remaining air out of the ice, the ice crystals absorbs all other colors from the spectrum, and reflect blue. 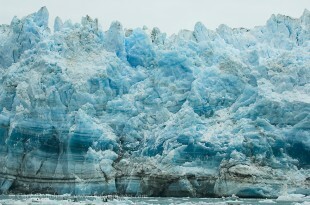 As glacial ice becomes exposed to the air, air bubbles find their way into the ice, and the ice loses its deep blue color and becomes whiter. 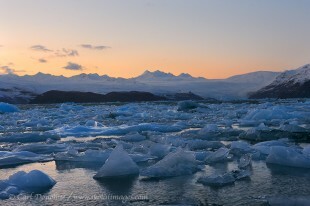 For licensing or purchasing any of these glacier photos, please contact Carl Donohue.